MySpace, everyone's favourite social-networking website until Facebook came along, is to drastically trim employee numbers in a bid to streamline the business. It has been announced that 420 jobs are to go in the US, with more to follow. MySpace's newly installed CEO Owen Van Natta has said that shrinking his workforce was a "necessary" decision. "Simply put, our staffing levels were bloated and hindered our ability to be an efficient and nimble team-oriented company," said Van Natta's statement. "I understand that these changes are painful for many. They are also necessary for the long-term health and culture of MySpace. Our intent is to return to an environment of innovation that is centred on our user and our product." While the cuts are just in the US at the moment, the Guardian is reporting that more are on the way, with MySpace's 1,600 employees to be whittled town to 1,000. The other job losses are said to happen in France, Italy and Spain. 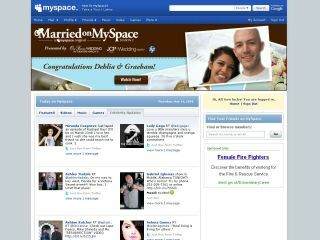 News Corp, owned by media mogul Rupert Murdoch, bought MySpace for $560 million back in 2005. Since then, the social-networking site has been overtaken by Facebook in the popularity stakes and Twitter is also stealing some of its thunder. Saying this, the site is still garnering 130 million unique users a month. CEO Van Natta is no stranger to MySpace's rivals. Before he took the top job at the website, he worked at Facebook as Chief Revenue Officer. Over at Facebook HQ, things are looking slightly rosier. The company has just moved offices in Palo Alto because they have grown too large for their old digs.